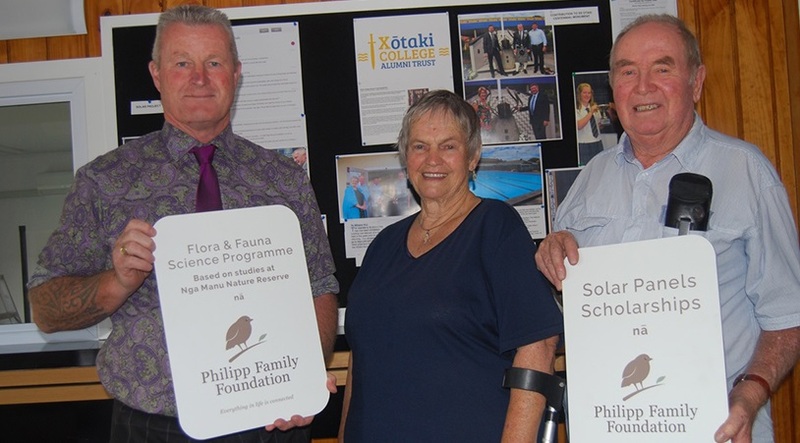 Two new plaques have gone up in the Ōtaki College hall foyer recognising the contribution of the Philipp Family Foundation (PFF). The foundation has made significant grants to the college in recent years. One is its support for the XŌtaki College Alumni Trust to install solar panels on the roof of the hall. PFF provided $26,000 to install the panels, and $3000 for a PFF scholarship last year. The savings from the solar panels will go towards an ongoing annual scholarship. Also last year, the science department extended the college’s relationship with Ngā Manu Nature reserve. It was able to do this with a grant from the foundation. A Ngā Manu staff member visited year 7 and 8 students last year, and year 9 students had the opportunity to be a ranger for a day. Year 10 visited the nature reserve, focusing on getting to know native species and water testing. Senior biology students (aged 16-18) also visited Ngā Manu, looking at animal behaviour, species variation and plant reproduction. Original generation time 1.3501 seconds.